The Samsung Galaxy S4 will be available with different processors in different countries, the US version of the handset will features a quad core Qualcomm processor with a clock speed of 1.9GHz. Now we have a video of the Samsung Galaxy S4 benchmarks being run on the quad core version of the Samsung Galaxy S4, have a look at the video below to see how the device performs. 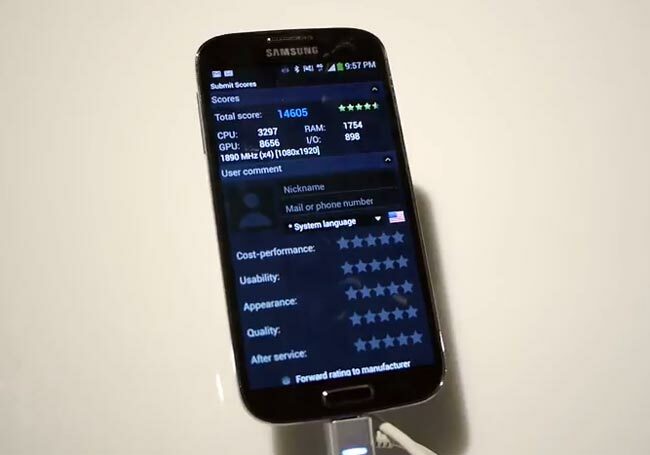 The international version of the Samsung Galaxy S4 will come with Samsung’s new 8 core Exynos 5 Octa processor with a clock speed of 1.9GHz, as soon as we get some details on how this processor performs we will let you guys know, in the meantime have a look at the Samsung Galaxy S4 specifications.